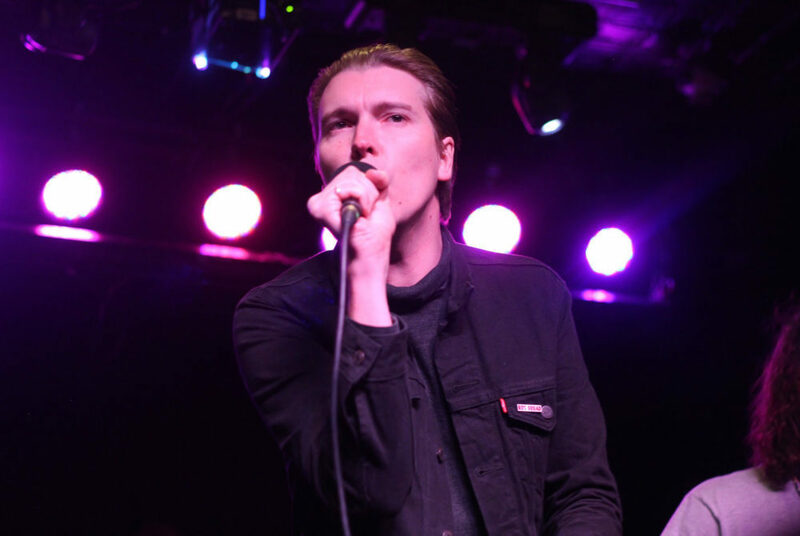 Musician Alex Cameron, who is playing a show at the Rock N Roll Hotel Friday, sat down with The Hatchet to talk about his upcoming performance. Musician Alex Cameron uses his controversial lyrics to mock downtrodden white male toxicity. Cameron has been featured on songs that have become memes, opened and co-wrote for the Killers and attracted the attention of some of indie’s elite. With songs like “Runnin Outta Luck” and “Country Figs,” this Australian artist blends 80s pop with a voice of blue collar dissatisfaction, all while telling stories of toxic men through his lyrics. Cameron is playing a show at Rock N Roll Hotel Friday. But before he takes the stage, he sat down with The Hatchet to talk about collaboration, the characters in his music and how the internet shaped his songwriting. Your songs have a veneer of Americana, but you were born and raised in Sydney, Australia. How would you say the U.S. and your home country have influenced your music’s sound and subject matter? Alex Cameron: Australia is heavily influenced by America, culturally, in terms of music, movies and unfortunately politically. A lot of Americans related to the record even though I wrote it with Australian stories in mind. Australia had this dirty version of your rock music or your new wave – We call it pub rock down here. I think we have this grittier way of telling stories that I was raised on. I saw you open for Angel Olsen at 9:30 Club, and you two collaborated on the song “Stranger’s Kiss” off your album. How did that collaboration come about? AC: Angel and I were pen-pals for a second. A year after we met we were writing to each other, exchanging demos and songs and then we happened to be in LA. Angel was making “My Woman” and we were making “Forced Witness,” so it was a timing thing. I felt like the song and record needed a powerful voice from someone that wasn’t a straight white dude. And felt that would give that other perspective that’s so sorely needed. The lyrics can at times be a little skeevy, dedicating some tunes to 17-year-old lovers. I’m sure that’s the intention, but do you worry about alienating listeners at times? AC: I’m a storyteller, and the way I’ve learned to tell stories is everything is on the table, because that’s how you get honesty across. There are characters on the record that I wish didn’t exist in real life, but everything on the record is grounded in reality. Delusion exists and that’s what I write about. I didn’t go to university, so I didn’t have a chance to have progressive discussions with peers. I just got straight into working and writing. What I thought I was writing about – self delusion and a sense of entitlement – I didn’t realize I was writing essentially about white male privilege. You’ve co-written songs and opened for The Killers. What was it like working with them? Did they give you any advice? AC: It was really enlightening. Brandon [Flowers] has got a really singular talent. He’s a very intuitive songwriter. We’ve become friends, but he keeps asking me why I make my songs have such decrepit content. He’s suggested the songs might be strong enough that they could be a little more mature and less crass. I am excited about exploring that storytelling one day, something more spiritual. AC: It’s always amplified experience when I write. I’ve had interactions online – I’ve been on the internet since I was 12 to 15 years old. The amount of time spent communicating with people I’ve never met is probably not something that is thought about enough. The internet is here, and it’s a part of the way we communicate. It was a natural thing to start putting it into the songs. You’ve written about delusion and unfulfilled success. With your work being well received and working with other artists, how do you feel crossing over to find more success in your work? AC: I remember reading and thinking, ‘what does someone who used to rap and sing about hardships do once they become successful, and how could they possibly keep that up?’ That’s a discussion I haven’t had to think about, because I’m still very much in debt, and I’m not even in a position where I can pay rent. I got a couple years working, still got stories to tell. It’s not lost on me that we’re selling tickets and we’re in a fortunate position. This article appeared in the March 8, 2018 issue of the Hatchet.